Natural Ethiopian Opal items in our online Opal Store! Try our Ethiopian Opal satisfaction guarantee - compare our prices and our superior quality. Select any of our natural Ethiopian opal images below to enlarge it. This unique piece of genuine Ethiopian opal gem rough is completely natural, just as it was found in the earth! 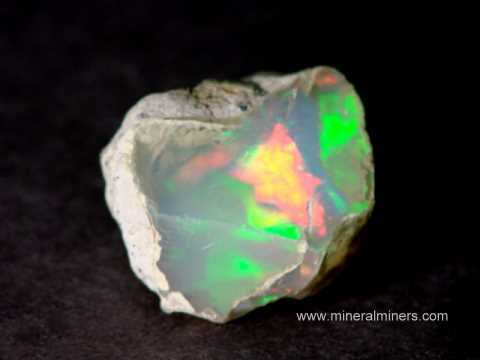 Within the opal there is very beautiful color-play in flashes of green, blue, red and orange colors as you turn it. This opal nodule is partially covered with matrix. It has a fresh surface break as shown at left which nicely reveals 5 carats of flawless transparent precious opal inside with fine color-play as shown. This untreated opal specimen makes a great mineral specimen of natural Ethiopian opal just as it is. This precious opal rough specimen could also be set into jewelry just as it is to make a wonderful Ethiopian opal jewelry item as well, or it could be fashioned into flawless opal gems with fine color play. See also an opposite side view photo of this lapidary grade Ethiopian opal rough specimen. Ethiopian Opal Specimen Dimensions: 1.1" x 1" x 0.65"
This untreated Ethiopian opal rough specimen is completely natural - just as it was found in the earth. There is a large area of flawless transparent opal inside weighing about 8 carats with light blue body color and very fine color-play showing beautiful flashes of green, red, and orange natural colors. These colors change as the light moves or as the piece is turned. The upper surface has a fresh break which nicely reveals the color-play inside. The bottom surface is covered with matrix. 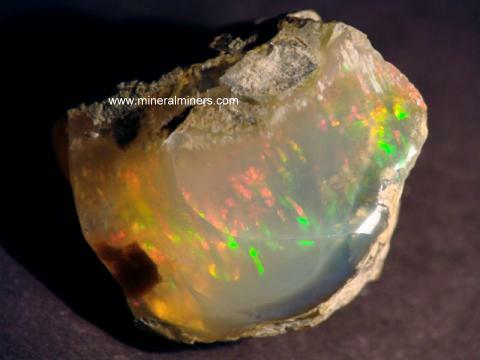 See also an opposite side view photo of this Ethiopian opal mineral specimen. Ethiopian Opal Specimen Dimensions: 0.85" x 0.6" x 0.4"
This untreated Ethiopian opal rough specimen is completely natural - just as it was found in the earth. It is flawless transparent opal with extra fine color-play showing beautiful flashes of green, red, orange and blue natural colors. These colors change as the light moves or as the piece is turned. The photo at left shows a fresh surface break which nicely reveals the color-play inside. Some surfaces have a small amount of matrix and cloudy opal. 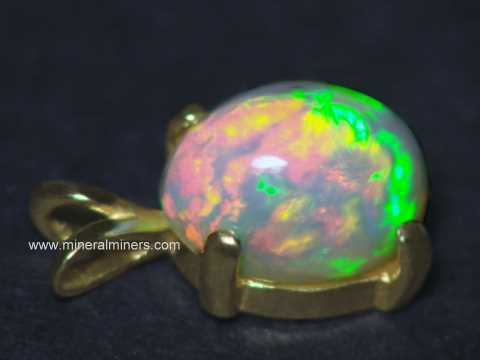 This lapidary grade precious opal specimen could be set into jewelry just as it is to make a very beautiful natural opal pendant. This untreated opal specimen also makes a great mineral specimen of extra fine natural Ethiopian opal just as it is. See also an opposite side view photo of this Ethiopian opal gem rough specimen. Ethiopian Opal Specimen Dimensions: 0.75" x 0.7" x 0.5"
This untreated Ethiopian opal rough specimen is completely natural - just as it was found in the earth. There is a large area of flawless transparent opal inside weighing about 12 carats with very fine color-play showing beautiful flashes of green, red, and orange natural colors. These colors change as the light moves or as the piece is turned. The photo at left shows a fresh surface break which nicely reveals the color-play inside. Some surfaces are mostly covered with a small amount of matrix. This lapidary grade precious opal specimen would yield a single completely clean transparent Ethiopian opal cabochon gem weighing 6 carats of very fine quality. This untreated opal specimen also makes a great mineral specimen of natural Ethiopian opal just as it is. See also an opposite side view photo of this Ethiopian opal gem rough specimen. Ethiopian Opal Specimen Dimensions: 1.4" x 1" x 0.55"
This unique piece of genuine Ethiopian opal gem rough will yield over 10 carats of flawless gemstones! It is completely natural, just as it was found in the earth. The opal is transparent with large flawless areas separated by some cracks. 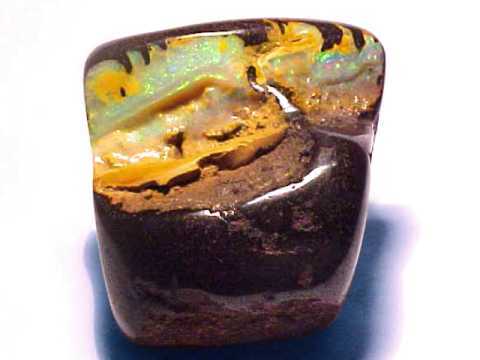 Within the opal there is very beautiful fine color-play in flashes of green, purple and blue colors as you turn it. The photo at left shows an area with a fresh surface break which reveals the color-play inside. Some surfaces are partially covered with a thin layer of matrix. The large flawless areas could be cut into completely clean Ethiopian opal gemstones with fine color play weighing over 10 carats total gem weight! This untreated opal specimen makes a great mineral specimen of natural Ethiopian opal just as it is. This precious opal rough specimen could also be set into jewelry just as it is to make a wonderful Ethiopian opal jewelry item as well. See also an opposite side view photo of this Ethiopian opal gem rough specimen. Ethiopian Opal Specimen Dimensions: 1.4" x 0.75" x 0.6"
This untreated Ethiopian opal rough specimen is completely natural - just as it was found in the earth. There is flawless transparent opal with light blue body color passing all the way thru this beautiful specimen. 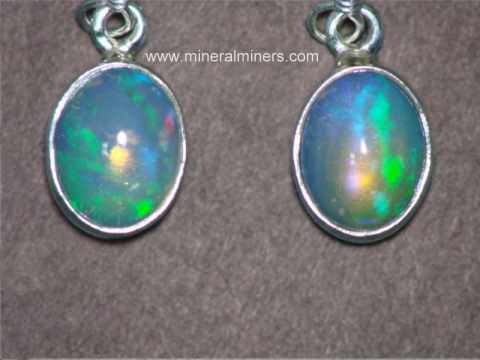 The opal has extra fine color-play showing beautiful flashes of green, blue, red, and orange natural colors. These colors change as the light moves or as the piece is turned. There is a fresh surface break on both the top and on the bottom which nicely reveal the color-play inside. There is a small amount of matrix on the sides. This lapidary grade precious opal specimen would yield some small completely clean transparent Ethiopian opal cabochon gems with extra fine color play. This untreated opal specimen also makes a great mineral specimen of natural Ethiopian opal just as it is, or it would look wonderful set into jewelry in its natural state. See also an opposite side view photo of this Ethiopian opal extra fine rough specimen. Ethiopian Opal Specimen Dimensions: 1.2" x 0.8" x 0.65"
This untreated Ethiopian opal rough specimen is completely natural - just as it was found in the earth. There is a large area of flawless transparent opal inside weighing about 15 carats with extra fine color-play showing beautiful flashes of green, red, and orange natural colors. These colors change as the light moves or as the piece is turned. The photo at left shows a fresh surface break which nicely reveals the color-play inside. Some surfaces are covered with matrix. This lapidary grade precious opal specimen would yield a completely clean transparent Ethiopian opal cabochon gems with extra fine color play. This untreated opal specimen also makes a great mineral specimen of natural Ethiopian opal just as it is. See also an opposite side view photo of this Ethiopian opal extra fine rough specimen. Ethiopian Opal Specimen Dimensions: 1.75" x 1.1" x 0.9"
This untreated Ethiopian opal rough specimen is completely natural - just as it was found in the earth. The opal is transparent with large flawless areas separated by some cracks. 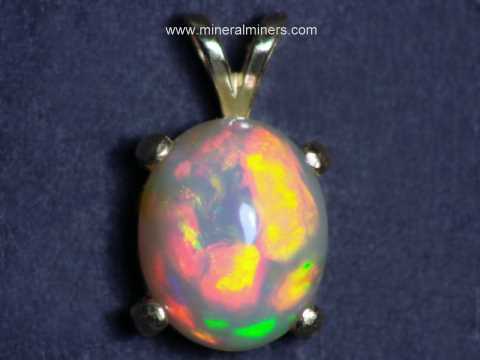 The opal has amazing extra fine color-play in flashes of green, purple, orange, red and blue colors as you turn it. The large flawless areas could be cut into several completely clean Ethiopian opal gemstones with extra fine color play! This untreated opal specimen makes a great mineral specimen of natural Ethiopian opal just as it is. See also another view of this Ethiopian opal extra fine rough specimen. Ethiopian Opal Specimen Dimensions: 1.75" x 1.5" x 1.2"
This untreated Ethiopian opal rough specimen is completely natural - just as it was found in the earth. 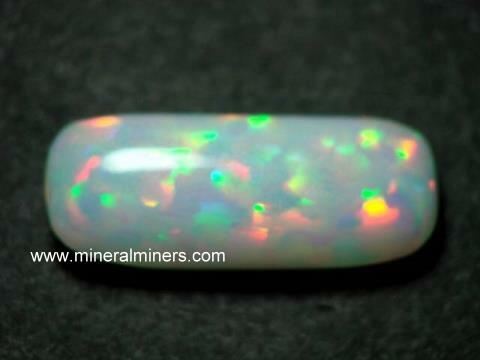 The opal is transparent with a huge flawless area that would yield a 20 carat cabochon gem! 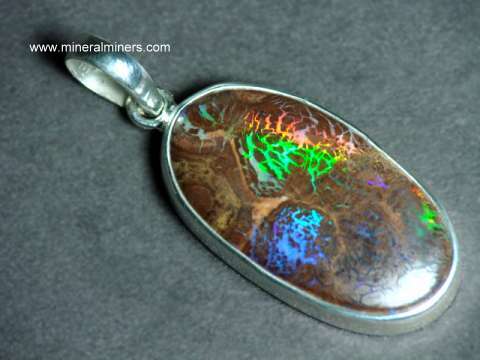 The opal has amazing extra fine color-play in flashes of green, orange, red and blue colors as you turn it. This untreated opal specimen makes a superb mineral specimen of natural Ethiopian opal just as it is. See also a side view of this Ethiopian opal extra fine rough specimen. 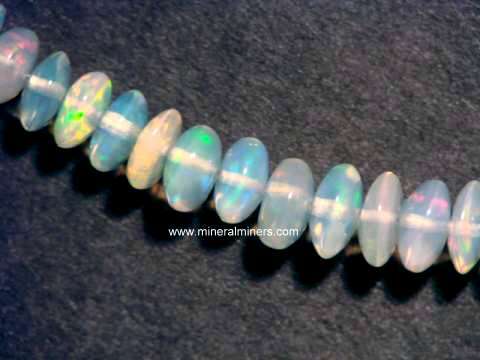 Each of Our Ethiopian Opals is natural untreated opal! 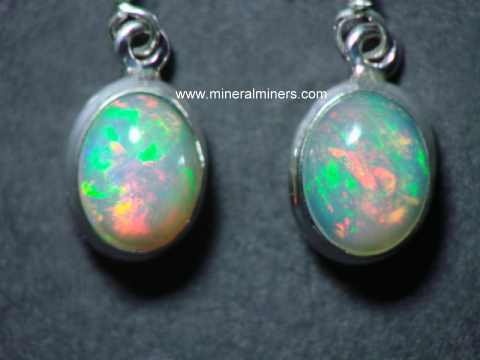 Here at mineralminers.com, we do not have any lab-created opal, we only have real natural opals that formed inside the earth. We have natural Ethiopian opal gem grade rough and mineral specimens available for use as collector quality mineral specimens just as they are, or they can be set in jewelry "as is". 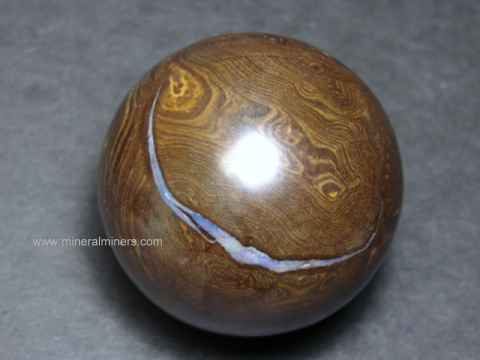 They also can be handcrafted into carvings and cabochon gems of natural solid opal with beautiful color play! We grade our Ethiopian opal gemstones from the lowest to the highest quality as follows: commercial quality - fine quality - very fine quality - extra fine quality. The recently discovered opal deposit near Delanta in the Welo Province of Ethiopia is producing very stable jewelry grade opal with amazing bright plays of green, red, blue, and orange colors in beautiful patterns. This Ethiopian opal is completely natural and has proven to be just as hard and stable as fine Australian opal and Brazilian opal. The body color of this natural Ethiopian opal ranges from golden-brown to white to colorless to blue, and the transparency varies from translucent to crystal clear. The transparent Ethiopian opals with color play are sometimes called jelly opal gemstones or crystal opal gemstones with beautiful flashes of color inside. Some of these natural Ethiopian opals tend to absorb water and change their transparency and colors if placed in water, and then they recover their original play of color and transparency after being removed from the water and drying out. This type of natural opal is known as hydrophane opal. We have these completely natural Ethiopian opals set into fine opal necklaces, wonderful opal earrings, and very beautiful opal bracelets! 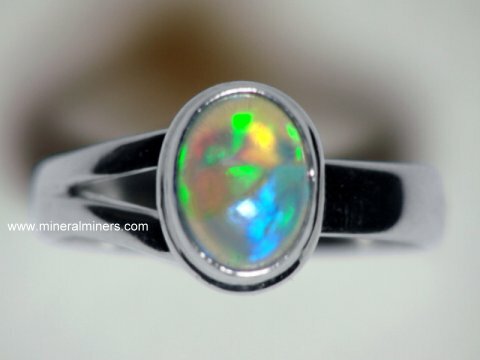 In addition to our beautiful Ethiopian opal mineral specimens and gemstones, we also have pages displaying Australian opal jewelry designs including natural boulder opal jewelry. We have several earring styles available in Welo opal earrings and Ethiopian opal earrings, and also a selection of Ethiopian opal necklaces. See our entire selection of Ethiopian opal jewelry. We have a variety of other opal items available including opal rough specimens. To see more opal photos, just select another linked image displayed below. Be sure to take a look at our Ethiopian opal ring designs set with amazing natural opals showing beautiful flashes of green, red, orange and blue natural colors! For additional opal information, see our opal page for natural opal facts & background info including opal history, occurance, and opal physical properties. 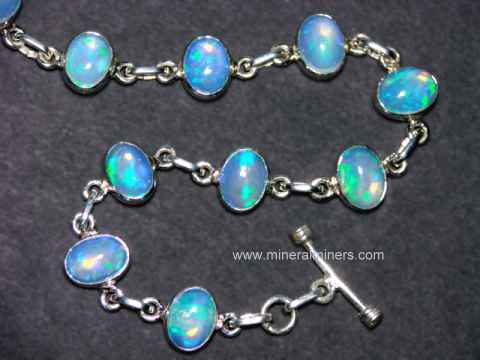 Would you like us to inform you when we add more rare quality natural Ethiopian opal items on this page? We have a large inventory of genuine Ethiopian opal gemstones, Ethiopian opal lapidary grade rough specimens, and Ethiopian opal jewelry items in stock, so be sure to let us know if you have any Ethiopian opal special requests. Please contact our webmaster or our 'site' geologist with any questions or comments.